Overview: So over the last 14 years of Thor adventures at Marvel, we have seen some epic runs led by some of the greats in comic book history. Stan Lee, Jack Kirby, Neal Adams, Gerry Conway, Roy Thomas, Len Wein, and John Buscema. With this final Essential Thor volume, we can now add Walt Simonson to that list. This book is very evenly divided between a long run by Buscema and a long run by Simonson, both overseen by writer Len Wein. There are a couple of extra inclusions, like the Annuals and the Tales of Asgard stories. But the three names to focus on our Wein, Buscema, and Simonson. The first half of the book feels like one long story, as Thor and his friends discover that Odin is missing, and must travel the stars in search of him. Along the way, the Norse deities encounter many obstacles along the way, before tracking down the All-Father being used as a power-source for the wall around the Doomsday Star. Returning to Asgard, the band of travelers finds that Loki has tricked Balder into surrendering the throne to him. Thor once again defeats his step-brother, and normalcy is returned to Asgard. This gives Thor the breather to return to Earth, where we get to finally see Dr. Donald Blake again. The highlight of this collection for me was Thor Annual #6, as Thor is kidnapped across time and space to help out the Guardians of the Galaxy. Mind you, this is not the GotG with Rocket and Groot that we fell in love with in the summer of 2014 – and eagerly awaiting their return this weekend! This is the original GotG with Major Vance Astro, Charlie-27, Martinex, Yondu, and Nikki. This is such a fun story! What makes this Essential? : I can give you two great reasons to read this book: 1) John Buscema; and 2) Walt Simonson. This is a book you buy primarily for the artwork. The stories are decent, but the non-stop space epic looking for Odin started to get stale after awhile. (Remember, this searching for Odin started in Essential Thor Vol. 6!) Towards the end of this volume, when Odin has been found and balance has been restored to Asgard (for now), Thor returns to Earth. And it’s like a breath of fresh air. We get to see Donald Blake again, and we see Thor interact with Iron Man and the Avengers. I get that there is a need for a character like Thor to be featured in EPIC stories, but so much of the charm of the Stan Lee-Jack Kirby Thor was that he was tethered to Earth by his dual identity. So, back to the art! I’ve sung the praises for Buscema in the past many times over. 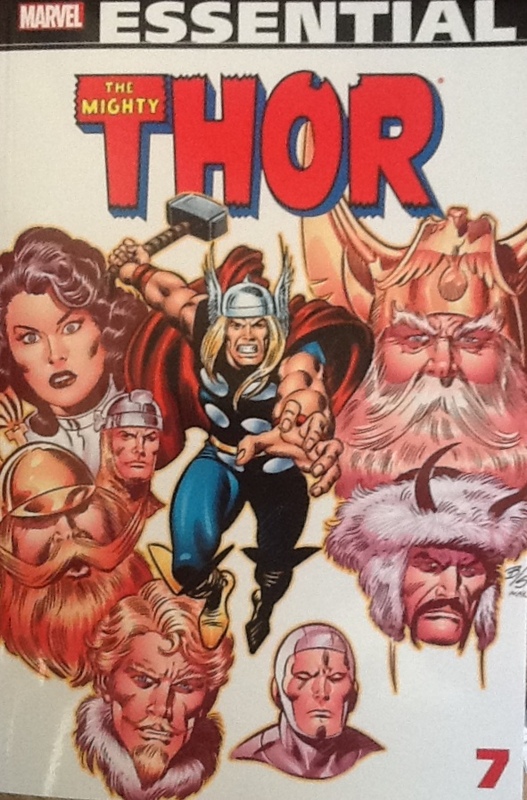 And I heartedly recommended Simonson’s second and more famous run on Thor during my review of Essential Thor Vol. 4. To get both of these artists in one book is worth the suggested retail price of this book! Give it a read while you can still find a copy on the shelves. If you like this volume, try: the current run of Mighty Thor by Jason Aaron. Back with my review for Essential Thor Vol. 3, I suggested you check out Aaron’s run on Thor, God of Thunder. That run came to an end in the fall of 2014, and this new series launched in October 2014. However, this is a different look at Thor. Sure, Thor still wields Mjolnir, still wears the red cape and helmet, and still calls Asgard home. But this Thor no longer uses the same bathroom as the Warriors Three. This Thor is now a female, as the inscription on the hammer reads “…if she be worthy….” Jason Aaron fully gets the big-picture view of Thor, Asgard, and Norse deities. This is an excellent companion piece to his first series, so please pick this up! This entry was posted in Marvel Essentials, Thor and tagged John Buscema, Len Wein, Thor, Tony DeZuniga, Walt Simonson. Bookmark the permalink. Spring Break 2017 – UPDATE!